The perfect accessory for any ethnic wardrobe! It's genuine Moroccan leather, famous the world over for centuries. 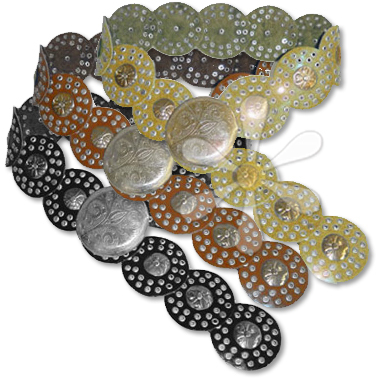 Successive discs are centered with a floral-embossed silver disc and two rows of open studwork. The gorgeous etched buckle anchors the fit, whether you wear it low on the hip or as a cinch at your natural waistline. Gorgeous!